THE words of Farnborough boss Garry Haylock came as sweet music to Ian Baird's ears after Eastleigh had registered their third Blue Square Bet South victory on the bounce with a 3-1 result at Cherrywood Road. 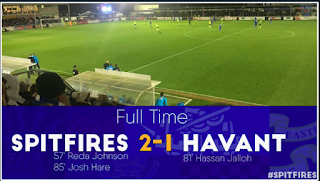 Haylock openly admitted that his side had been "out-fought" by the resurgent Spitfires, adding: "If you don't match teams physically you are going to get beaten up - and today we got beaten up." Turn the clock back a few weeks and both Hampshire clubs were at the wrong end of the table trying desperately to find their feet after undergoing major changes of playing personnel during the summer. But whereas fourth-to-bottom Farnborough are still struggling, having lost their last seven games, Eastleigh have improved to such an extent that they are now 11th, just five points outside the play-off zone. "The way I see it is we're four wins away from safety," said Spitfires boss Baird. "But as I said to the players beforehand, the Farnborough game could define which way our season was going to go. "I asked them are we going to be fighting a constant battle against relegation or are we going to continue our good form and set our sights a lot higher?" Although the players made no reply in the dressing room, their response on the field said it all. 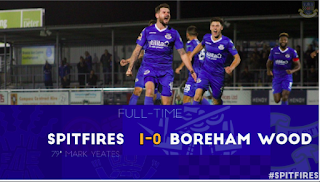 Having taken a 17th minute lead when Andrew White pounced after Chris Flood's effort had been parried, the Spitfires were pegged back to 1-1 by Reece Connolly early in the second half just minutes after having a clear penalty shout turned down. 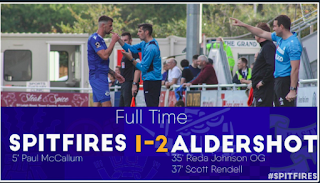 Instead of caving in, Eastleigh grew in stature and reclaimed the lead through Andy Forbes on 74 minutes before Jamie Slabber headed down for sub Jamie Brown - on for dead leg victim Tom Jordan - to bury a third five minutes later. "We had a stonewall penalty turned down for a foul on Chris Flood. The dugouts are quite close together and even Garry Haylock said they got away with that one," said Baird. "As often happens, Farnborough went straight down the other end and equalised, but our lads fully deserved the win. "There's a lot of confidence in the squad now with a good mixture of young and old, but we've got a hard run of fixtures ahead of us with (third-placed) Dartford at home in the league on Saturday, a tough FA Trophy tie at Chippenham and a trip to leaders Woking. "This season is all about surviving and building for the future. "I've said all along that if we get 13 wins and four draws we will stay up." Eastleigh have extended winger Graeme Montgomery's loan from Aldershot Town for a further month and must sort out left-back Michael Green's future with Port Vale now his initial month's loan is over.